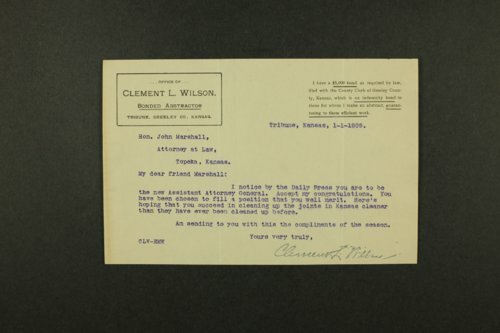 Correspondence relating to the Kansas State Temperance Union and its activities promoting the enforcement of prohibition in the state of Kansas. Frank M. Stahl served as superintendent and John Marshall served as attorney. They wrote a number of the letters contained in this collection. Leaders of the temperance movement frequently corresponded with county attorneys, civic leaders, ministers, and pastors. Included are several letters supporting James A. Lyons of Langdon, Kansas, who was charged with selling intoxicating liquors, and a circular announcing the guilty verdict in the case of Assistant Attorney General C. W. Trickett of Wyandotte County, Kansas, who accepted illegal fees in the prosecution of liquor cases. The collection contains correspondence from numerous Kansas communities.